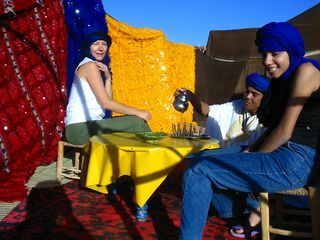 Our trekking activity is based on Merzouga sand dunes, we used as the starting place the beautiful hotel Kasbah Mohayut. 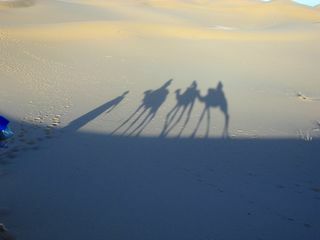 Starting at two person, you will go with the guide and one camel by person. 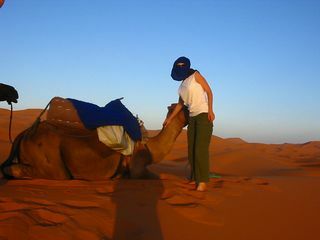 The trek can be one upcto seven days all along the Algerian boarder, crossing sand dunes (Erg Chebbi, Erg Ouzina), Reg, Hamada, you will visit somes oasis (Saf saf) and meet nomades people. 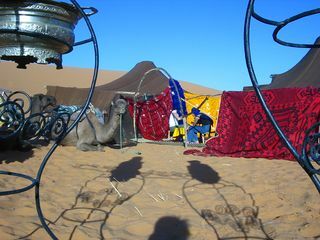 The night you will use our tent (single) or sleeep in a fix campement. The guide manage the meal and you get new food arrival each 2 days. You don't need sleeping bag. The trip is adjustable to your whishes but some passing points are necessary to join the food refilling.